Classical music festivals - Wikipedia. Festival & Performance Guide - Classical-Music.com. List of classical music and opera festivals in U.K. - Wikipedia. List of classical music festivals - Wikipedia. Top 10 classical music festivals - "Candidly ranked by Howard Hillman." ARENA DI VERONA - since 1913. Summer festival of opera, located in the city of Verona, Italy. Bach Festival - since 1904. Music festival which takes place annually in the city of Leipzig, where J. S. Bach worked as the Thomaskantor from 1723 until his death in 1750. 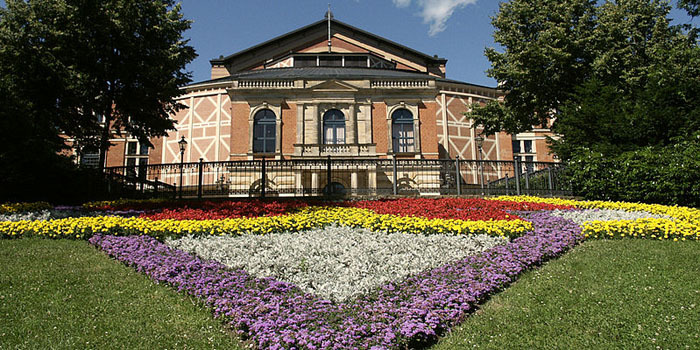 BAYREUTHER FESTSPIELE | BAYREUTH FESTIVAL - since 1876. Music festival held annually in Bayreuth, Germany, at which performances of operas by the 19th century German composer Richard Wagner are presented. Chopin Piano Fest Pristina - festival established for the first time on the occasion of the 200th birth anniversary of Chopin in 2010,in Prishtina, Kosova by the Kosova Chopin Association. Dresden Music Festival - since 1978. Annual music festival which takes place in Dresden, Germany in May and June. Edinburgh Festival - since 1947. Collective term for many arts and cultural festivals that take place in Edinburgh, Scotland each summer, mostly in August. Though the festivals are put on by various organizations unrelated to each other, and so are officially separate events, they are regarded by many visitors as part of the same event; and together they form the largest annual cultural festival in the world. GLYDEBOURNE FESTIVAL OPERA - since 1934. Opera festival held at Glyndebourne Opera House, an English country house near Lewes, in East Sussex, England. INTERNATIONAL TROMBONE FESTIVAL - since 1972. SALZBURG FESTIVAL - since 1920. Prominent festival of music and drama. It is held each summer (for five weeks starting in late July) within the Austrian town of Salzburg, the birthplace of Wolfgang Amadeus Mozart. Spoleto Festival USA - since 1977. Charleston, South Carolina. One of the world's major performing arts festivals. It was founded in 1977 by Pulitzer Prize-winning composer Gian Carlo Menotti, who sought to establish a counterpart to the Festival dei Due Mondi (the Festival of Two Worlds) in Spoleto, Italy. The annual 17-day late-spring event showcases both established and emerging artists in more than 150 performances of opera, dance, theater, classical music, and jazz. VERBIER FESTIVAL - since 1994. International music festival that takes place annually for 2 weeks in late July and early August in the mountain resort of Verbier, Switzerland.